Mountain climbing to sleeping on a hammock suspended between cliffs, the Sherp has put up list of festivals which will excite, inspire and guarantee you the rush of adrenaline. Bridge Day, Fayetteville, West Virginia: the world’s most unique festival. Bridge Day is a fantastic place to make your first jump. This festival is held in October on the third Saturday. Over 100000 people come to watch the BASE jumpers leap from the bridge that’s 876 feet above the New River. The New River Gorge Bridge is a big challenge for jumpers due to the wind conditions and a river with rapids force at the bottom. 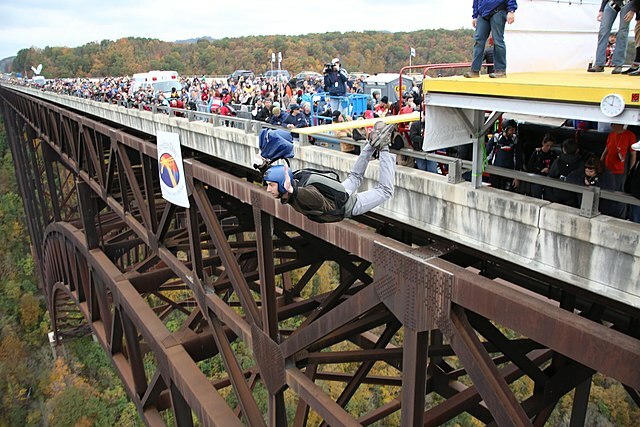 Bridge Day is West Virginia largest one day festival with largest extreme sports events in the world along with great view, food and crafts vendors. The town is a beautiful blend of old and new excitement, relaxation, mountain and valley. On the festival of the Bridge Day the traffic is shut down so that the spectators can safely and legally walk across the world second longest single arch bridge located in Fayette County, West Virginia. Crested Butte Bike Week, Colorado: it is a four days event celebrated in the month of June. This festival consist of all activities right from mountain bike, races, bike films, and clinics, free guided rides, kid’s activities, fun tours, costumes and the chainless world championships. It is the oldest mountain bike festival in the world. This is where a rider can experience one of the birth places of mountain biking and ride miles and miles of single track. The week ends up in a party and live music in downtown Crested Cutte. Royal Gorge white water festival, Canon City, Colorado: This festival occurs on June 22 and 23rd. The Royal Gorge White water Festival is a two day event held in Cenntennial Park. There is a very popular community Raft Race where there are crew navigating the frothing water of White water park, where spectators line the banks to cheer them on with local craft brews in hand. You will not only enjoy the festival event but also plenty of food, beer, vendors and entertainment for the entire family. It is the biggest party of the summer in Canon city and one not to be missed. World ski and snowboarding festival, Whistler, British Columbia has been popular for the past 22 years. It’s the festival that takes the spirit of spring in Whistler and mixes it with the best of our mountain culture for 10 days of non-stop. Snow lover’s takes part in the ski and snowboard competitions, Demonstrations, action photography, theatre film and concerts. Freestyle open slope style, big air and other events keep the action going all day and non- stop night life. Lower keys underwater Music Festival at Looe Key Reef Florida. This festival is held in July. Scuba divers and snorkelers take part in the underwater concert. The unique event showcases the colourful diversity of marine life that characterizes North Americas only living coral barrier reef plus instruments. There is actual music piped into the sea. Those planning to submerge themselves in the festival can stop by Looe Key Reef resort for a free dive clinic, buoyancy tests and equipment checks to get divers ready for the unique underwater experience. This year’s theme includes humpback whale songs and melodies like the Beatles “Yellow Submarine and jimmy Buffett’s, Fins. The audience enjoy the tunes from underwater as well. All divers and snorkelers participating in the marine musical event are encouraged to wear costumes and aim for a prize for the best dressed. Kila Raipur Rural Olympics: the Kila Raipur sports Festival is a rural festival depicting salt-of-the-earth sport and games from Punjab. This festival attracts thousands and thousands of tourists every year. It is a 3 day event. Do not miss out on the bullock cart races, camel races, the tractor races, the horse dance and last the tug of war. If you‘re into adventure sports and are backpacking across northern India this would be an apt pit stop for you. So enjoy at this U.S., Canadian and Indian festival that celebrates the comradery and thrill for outdoor adventure.